CREDIBLE as it may appear to those who have paid but slight attention to the subject of the ancient ecclesiastical antiquities of Ireland, it is nevertheless a fact that there now exist in this country some hundreds of churches, which, in point of antiquity at least, may be classed among the most remarkable structures of Christian times now to be found in Europe. The remains of which we shall now speak carry with them incontestible evidence of their remote era. Their architectural features and details are of such a character, that our surprise is not so great on account of their antiquity as Christian "Teampulls," as at their appearance in structures of an era so comparatively late, for they are often truly Etruscan. Of their usual characteristics we shall here give a brief description, referring the reader who may desire more than a general sketch to Dr. Petrie's beautiful work, already mentioned, in which the subject has been fully discussed. I. DOORWAYS.—Covered by a horizontal lintel, or headed with a semicircular arch, springing from plain, square-edged imposts. Occasionally the arch is cut out of a single stone. At Glendalough are examples in which the lintel is surmounted by a semicircular arch, the space between being filled up with masonry. The stones generally extend the whole thickness of the wall. Few of the very early doorways exhibit any kind of decoration beyond a plain projecting band, of which there are some fine examples at Glendalough. The door appears to have been placed against the interior face of the wall, as, in many instances, the stones, for a distance of about three inches from the angle, have been slightly hollowed, evidently for the reception of a frame. II. WINDOWS.—Invariably small, and splaying internally; headed, generally, with small, semicircular arches, either formed of several small stones, or cut out of a single large one; but the horizontal lintel is common, as is also the triangular head. The sides of the windows, like the doorway jambs, almost invariably incline. They are rarely decorated, and then in the simplest manner, by a projecting band, similar to that occasionally found upon the early doorways, or by a small head. III. CHOIR ARCH.—In the very ancient churches to which chancels are attached, the connecting arch is invariably semicircular, square-edged, and plain. It is usually formed of stones pretty equal in size, well hammered, and admirably fitted to each other. The greater number of the ancient Irish churches, however, have no chancel, their plan being a simple oblong. IV. BELFRIES.—The "Cloig-theach," or round tower, appears to have been the most usual belfry. The ancient structure at Glendalough, called St. Kevin's Kitchen, supports upon its western gable a small tower which appears to have answered this purpose. Bell-turrets, properly speaking, were not common before the thirteenth century. V. MASONRY.—Generally of very large stones, well fitted together, as in cyclopean work. In some of the oldest examples no mortar appears to have been used, but these instances are very rare and mortar is generally found cementing enormous stones, but never in large quantities. VI. ROOFS.—The roofs of most of the very ancient Irish churches have long disappeared, but several of stone still remain. Their pitch is exceedingly high, and they are generally constructed upon arches. Examples occur in St. Columb's house at Kells, in Cormac's Chapel at Cashel, in St. Kevin's Kitchen at Glendalough, and in a few other structures. Such are the more usual and prominent characteristics of the early Irish churches. It should be observed, that the doorway, with few exceptions, is almost always found to occupy a position in the centre of the west end. The windows in chancelled churches are generally five in number: one in the eastern gable, and one in each of the side walls of the nave and choir. The original doorway, which, as usual, is placed in the centre of the west gable, and of which we affix an illustration, is remarkable for having a cross sculptured upon the under part of its lintel. It measures in height six feet and one inch; in breadth at the top, two feet, and at the bottom, two feet four inches. The next feature to be noticed is the choir arch. Its general style and form will be best explained by the sketch, which was taken from the north-east angle of the chancel. This, which may be looked upon as a most characteristic example of its class, measures in breadth, where the arch begins to spring, four feet seven inches, and at the base, four feet ten inches and a half; its height is only six feet and a half. The chancel windows display the inclined sides, so indicative of antiquity when found in Irish ecclesiastical remains, but, with the exception of that facing the east, they are in a state of great dilapidation. The eastern window is square-headed, both within and without, and exhibits the usual splay. The comparatively modem addition on the northern side of the nave, which appears to have been erected as a kind of aisle, is connected with the ancient church by several openings broken through the north side wall. It will be well to compare its architectural features with those of the original structure. The doorway which is here represented offers a striking contrast to that in the west gable, and its eastern window is equally different from that in the ancient chancel, being larger, and chamfered upon the exterior. 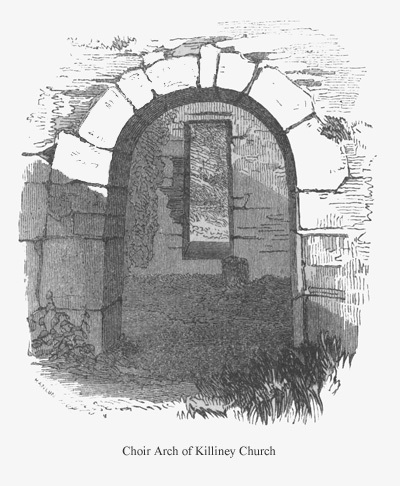 The fact of a semicircular arch-head being cut out of a single stone is of itself no proof of high antiquity, as it occurs in many comparatively late structures in Ireland; and in England we recollect to have seen in the "Perpendicular" church of Kirkthorpe, near Wakefield, a door-head that exhibited this mode of construction. The church of Kilternan, in the neighbourhood of which is the noble cromlech described in page 13, presents several features of considerable interest. The south side wall and the west gable are original, and of great antiquity. The latter contains a square-headed doorway, now stopped up with masonry; and to supply its place, a pointed doorway has been inserted in the south side wall. This alteration was made, probably, at the time of the re-erection of the eastern end, the style of which indicates a period not earlier than the close of the thirteenth century, about which time the custom of placing the doorway in the west end appears to have ceased. There are several other churches in the immediate neighbourhood of Dublin which contain features of very high antiquity, but they have been altered and remodelled at various times, and are, upon the whole, characteristic of later periods. Some of these we shall notice when describing the early pointed style, as found in Irish remains, confining our remarks for the present to such examples of the primitive ecclesiastical architecture of Ireland as are easy of access from Dublin. The lone and singularly wild valley of Glendalough, in the county of Wicklow, lying at a distance of about twenty-four miles from the metropolis, presents a scene which, for stern and desolate grandeur, is in many respects unsurpassed. Huge, gloomy mountains, upon which clouds almost continually rest, encompass, and in some places overhang, the silent and almost uninhabited glen. Two little lakes, now appearing in the deepest shadow, now reflecting the blue vault, according as the clouds above them come or go,—a winding stream, and grey rocks jutting here and there from out the heath,—form its natural features. A noble monastic establishment, round which a city subsequently rose, flourished, and decayed, was founded here in the early part of the sixth century by St. Kevin. The ruins of many ecclesiastical structures yet remain, and "the long, continuous shadow of the lofty and slender Round Tower moves slowly, from morn till eve, over wasted churches, crumbling oratories, shattered crosses, scathed yew trees, and tombs, now undistinguishable, of bishops, abbots, and anchorites. 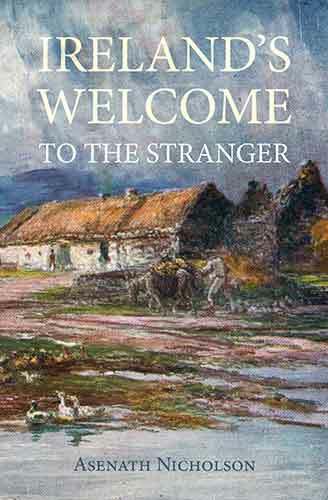 "* How few of the gay tourists by whom the glen is yearly visited view these ruins with any other feeling than that of idle and ignorant curiosity. Their ears have been poisoned with the burlesque and lying tales [inventions of the last half century] which the wretched men and women, miscalled guides of the place, have composed for the entertainment of the thoughtless. They wander unmoved among shrines which, nearly thirteen centuries ago, were raised in honour of their God by men joyous and thankful in the feeling of certain immortality,—men whose fathers in their youth had reverenced the Druid as a more than human counsellor. That several of the existing churches formed part of the original foundation, their style of architecture sufficiently indicates. The noble doorway of "the Lady's Church," a modern name, is, perhaps, the grandest of its kind remaining, and exhibits, in a striking degree, that early Greek form which is so very commonly found in the doorways and in other openings of our most ancient churches and Round Towers, and even, though more rudely developed, in the cathairs [cahers], and other Irish remains of the Pagan era. 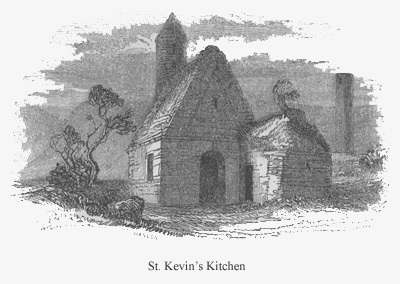 The remarkable building called St. Kevin's Kitchen, now, alas! sadly mutilated, is not the least interesting object in the group. Its high-pitched roof of stone remains in a perfect state. A doorway in the western gable displays an instance of the lintel surmounted by an arch. The chancel, which a few years ago remained, though of great antiquity, and stone-roofed, appears to have been an addition; and a portion of the ancient east window may still be observed in the wall, just above the head of the choir arch, which was not formed in the usual manner, but cut out of the masonry. The little tower upon the west end appears to be the earliest example of a belfry springing from a roof or gable; but this, as well as the sacristy, is of later date than the rest of the building. In that singularly interesting ruin, styled the Monastery, are columns which, upon their capitals, exhibit ornamental sculpture of a style peculiar to monuments of the ninth and tenth centuries These in England would be pronounced Norman, more particularly as the arch which they were designed to sustain displayed a variety of the zig-zag, or chevron moulding, as may be seen from several of its stones which yet remain. The Refeart, or Royal Cemetery Church, though less imposing in its general appearance than several of the equally ancient remains in the more eastern part of the glen, is, on account of its association with the life of the founder, not surpassed in interest by any of the others. In the cemetery of this (Refeart) church was preserved, a few years since, an ancient inscribed tombstone, popularly called King O'Toole's Monument; but it has disappeared, "the guides" having sold it in small pieces to tourists, scarcely less ignorant than themselves. The large structure standing within the enclosure of the cemetery, a little eastward from the Round Tower, is popularly styled "the Cathedral," and appears, from its name, dimensions, and position, to have been anciently the Domhnach more, or Daimhliag-mor, or chief church of the place. Notwithstanding its present state of dilapidation, there are in Ireland few structures of the same antiquity and extent that retain so many original features. The tower adjoining is one of the largest and most perfectly preserved now remaining. Its semicircular doorway-head, carved out of a single stone, may be looked upon as a good example of that peculiar mode of construction. A caiseal, or wall, appears usually to have enclosed the greater number of the ancient Irish monastic establishments. That such a work anciently existed at Glendalough is certain, though scarcely a vestige of it at present remains above ground. One of the gateways, however, until very lately, stood in a nearly perfect state. It is described and engraved by Dr. Petrie, Essay on the Round Towers, page 447, and his prophecy that, for want of care, this monument, unique in its kind, would soon cease to exist, became half fulfilled last summer upon the fall of the principal arch. We have but slightly glanced at the greater and more generally interesting ruins of this celebrated glen. It also contains numerous relics, such as crosses, monumental stones, &c., which, by a visitor, should not be overlooked; but, as we shall have occasion to refer our readers to other and much finer remains of each class of antiquities which they represent, it would be at least unnecessary to describe them here. We may, however, mention the singular chamber called "St. Kevin's Bed." That it is altogether a work of art cannot be satisfactorily demonstrated. Though, to a certain degree, its artificial character is distinctly marked, it is quite possible that a natural cavity, the sides of which have been roughly hewn and squared, may have existed previously. The Bed, which is situate in an almost overhanging rock, at a considerable distance above the lake, is said to have been the residence of St. Kevin, when pursuing that course of study and contemplation for which his name, even to this day, is revered; and the celebrated Saint Laurence is said to have spent much of his time in prayer and heavenly contemplation in this cavern. One of the earliest examples of cylindrical vaulting remaining in Ireland occurs in the structure called St. Columb's House at Kells, county of Meath. The arch, which is completely devoid of ornament, springs from the side walls, and separates the body of the building from a small croft, to which access was anciently gained by a quadrangular opening, about nineteen inches in breadth, adjoining the west gable. Two walls, crossing and resting upon this arch, and pierced each with a small semicircular-headed doorway, together with the gables, support a roof of stone. The lower apartment was lighted by two windows, one in the centre of the east end, the other in the south side wall. Both windows are small, and splay inwardly. That to the east is formed with a semicircular arch, while the other presents a triangular head. The ancient doorway which was in the west end has been destroyed. 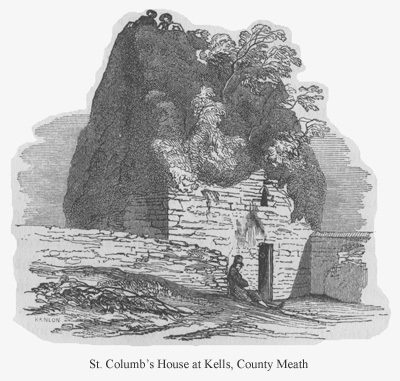 St. Columb's House is supposed to have combined the purpose of an oratory with that of a habitation, and in this respect to class with St. Kevin's House or Kitchen at Glendalough, St. Flannan's House at Killaloe, and one or two other structures. Whether we regard it as a habitation of the eminent ecclesiastic whose name it bears, or as a church, to which purpose this, in common with similar buildings, was certainly through many ages applied, it is a ruin of no common interest, and we strongly recommend such of our readers as may have a day or two to spare, to visit Kells. The Round Tower adjoining, and the various crosses in the cemetery and in the market-place, afford severally an admirable study. The latter are inferior in size only to the beautiful remains at Monasterboice, of which notice will be found in a subsequent chapter.